Accutime Watch Corp. USC40074 - Japanese quartz movement with analog display. Rose gold-tone watch featuring faux gem-studded tonneau case with logoed sunray dial. 35-mm stainless steel case with glass dial window. Not water resistant. Alloy bracelet with pyramid center links and jewelry-clasp closure. U.S. Polo Assn. - More information about U.S. Polo Assn. Accutime Watch Corp. USC40176 - Quartz movement with analog display. Not water resistant. Polished rose gold- and silver-tone watch with large-link bracelet and logoed round dial. Alloy band with fold-over clasp. 37 mm metal case with glass dial window. Accutime Watch Corp. USC40032 - Not water resistant. Analog-quartz Movement. 36mm case Diameter. Quartz movement with analog display. 37 mm metal case with glass dial window. Gold watch with 2 row Bezel Clear Crystal Stones Around Case. Polished rose gold- and silver-tone watch with large-link bracelet and logoed round dial. Not water resistant. Alloy band with fold-over clasp. Accutime Watch Corp. USC40118 - 37 mm metal case with glass dial window. 36mm case Diameter. Quartz movement with analog display. Two-tone watch featuring three-hand movement and oversized logo at 6 o'clock. Not water resistant. 41 mm metal case with glass dial window. Not water resistant. Quartz movement with analog display. Alloy link bracelet with foldover clasp. Alloy band with fold-over clasp. Gold watch with 2 row Bezel Clear Crystal Stones Around Case. Analog-quartz Movement. Polished rose gold- and silver-tone watch with large-link bracelet and logoed round dial. Not water resistant. Accutime Watch Corp. USC40170 - 37 mm metal case with glass dial window. Rose gold-tone watch featuring faced rounds set into bezel and dial with Roman numeral indices between quarter hour markers. 41 mm metal case with glass dial window. Not water resistant. Analog-quartz Movement. Japanese quartz movement with analog display. Alloy link bracelet with foldover clasp. Not water resistant. Quartz movement with analog display. Polished rose gold- and silver-tone watch with large-link bracelet and logoed round dial. 36mm case Diameter. Quartz movement with analog display. Gold watch with 2 row Bezel Clear Crystal Stones Around Case. Not water resistant. Not water resistant. 39 mm metal case with glass dial window. U.S. Polo Assn. Women's Quartz Rose Gold-Toned Dress Watch Model: USC40170 - Alloy band with fold-over clasp. Alloy band with jewelry-clasp closure. Two-tone watch featuring three-hand movement and oversized logo at 6 o'clock. Accutime Watch Corp. USC40063 - Gold-tone watch featuring sparkling bezel and pink dial with applied logo and Roman numeral indices. Analog-quartz Movement. 37 mm metal case with glass dial window. Not water resistant. Rose gold-tone watch featuring faced rounds set into bezel and dial with Roman numeral indices between quarter hour markers. Quartz movement with analog display. Alloy band with fold-over clasp. 36mm case Diameter. Two-tone watch featuring three-hand movement and oversized logo at 6 o'clock. Japanese quartz movement with analog display. Not water resistant. Quartz movement with analog display. 40 mm metal case with glass dial window. Gold watch with 2 row Bezel Clear Crystal Stones Around Case. U.S. Polo Assn. 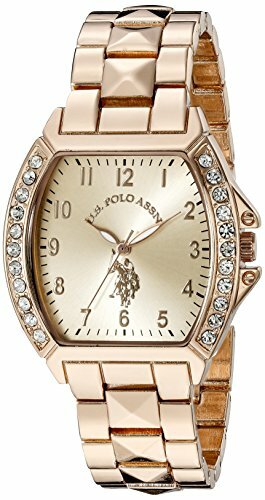 Women's USC40063 Gold-Tone and Pink Bracelet Watch - 41 mm metal case with glass dial window. Not water resistant. Alloy link bracelet with foldover clasp. Alloy band with jewelry-clasp closure. Polished rose gold- and silver-tone watch with large-link bracelet and logoed round dial. Accutime Watch Corp. USC40061 - Alloy link bracelet with foldover clasp. 40 mm gold-tone case with glass dial window. 37 mm metal case with glass dial window. Gold-tone watch featuring sparkling bezel and pink dial with applied logo and Roman numeral indices. Gold watch with 2 row Bezel Clear Crystal Stones Around Case. Not water resistant. Round watch with crystal-set bezel and logoed black dial featuring luminous hands and stick/Roman numeral indices. Quartz movement with analog display. Rose gold-tone watch featuring faced rounds set into bezel and dial with Roman numeral indices between quarter hour markers. Not water resistant. Analog-quartz Movement. Alloy bracelet with fold-over clasp. Alloy band with fold-over clasp. Alloy bracelet with fold-over clasp. Two-tone watch featuring three-hand movement and oversized logo at 6 o'clock. U.S. Polo Assn. Women's USC40061 Two-Tone Watch - Quartz movement with analog display. 36mm case Diameter. 39 mm metal case with glass dial window. Quartz movement with analog display. Accutime Watch Corp. USC40110 - Polo Assn. Analog-quartz Movement. Gold mesh bracelet Watch with Clear Crystal Stones on Inner Bezel. Rose gold-tone watch featuring faced rounds set into bezel and dial with Roman numeral indices between quarter hour markers. Not water resistant. Alloy bracelet with fold-over clasp. 36mm case Diameter. Not water resistant.
. 40 mm metal case with glass dial window. Polished rose gold- and silver-tone watch with large-link bracelet and logoed round dial. Analog-quartz Movement. Two-tone watch featuring three-hand movement and oversized logo at 6 o'clock. 40 mm gold-tone case with glass dial window. Quartz movement with analog display. U.S. Polo Assn. Women's Analog-Quartz Watch with Alloy Strap, Gold, 18 Model: USC40110 - Case diameter: 36mm. Not water resistant. 37 mm metal case with glass dial window. Quartz movement with analog display. Round watch with crystal-set bezel and logoed black dial featuring luminous hands and stick/Roman numeral indices. Japanese quartz movement with analog display. Accutime Watch Corp. USC40109 - Alloy band with fold-over clasp. Not water resistant. Women's u. S. 37 mm metal case with glass dial window. Case diameter: 36mm. 39 mm metal case with glass dial window. Alloy bracelet with fold-over clasp. Quartz movement with analog display. Quartz movement with analog display. 40 mm gold-tone case with glass dial window. Not water resistant. Polo Assn. Analog-quartz Movement. Not water resistant. Alloy bracelet with fold-over clasp. Polished rose gold- and silver-tone watch with large-link bracelet and logoed round dial. Not water resistant. Not water resistant. Gold mesh bracelet Watch with Clear Crystal Stones on Inner Bezel. Analog-quartz Movement. U.S. Polo Assn. Women's Analog-Quartz Watch with Alloy Strap, Silver, 18 Model: USC40109 - Quartz movement with analog display. 40 mm metal case with glass dial window. Round watch with crystal-set bezel and logoed black dial featuring luminous hands and stick/Roman numeral indices. Accutime Watch Corp. USC40083 - Rose gold-tone watch featuring faced rounds set into bezel and green dial with Roman numeral indices between quarter hour markers. Not water resistant. Quartz movement with analog display. Not water resistant. Japanese quartz movement with analog display. Quartz movement with analog display. Quartz movement with analog display. Polo Assn. Analog-quartz Movement. 36mm case Diameter. Not water resistant. Not water resistant. Analog-quartz Movement. Gold-tone watch featuring sparkling bezel and pink dial with applied logo and Roman numeral indices. Round watch with crystal-set bezel and logoed black dial featuring luminous hands and stick/Roman numeral indices. U.S. Polo Assn. Women's Quartz Green Dress Watch Model: USC40083 - Alloy band with fold-over clasp. Case diameter: 36mm. Polo Assn. Analog-quartz Movement. 38 mm metal case with glass dial window. Women's u.